Tresind, the modernist Indian restaurant located on level 2 at Nassima Royal Hotel, Dubai has been a firm favourite among diners in the city – myself included – since opening. Having closed its doors over the summer to undergo a complete refurbishment and menu change, we’ve been eagerly waiting to see the changes, and can confirm that the re-vamp is simply beautiful, and the restaurant is better than ever. Inside the layout is much more open-plan, with a welcoming bar and lounge area now situated to the left as you enter. Gorgeous, strong hues of blue adorn the walls, while bright, multi-colour fabrics cover the dining chairs and cushions. Seated at the table, it feels homely and intimate, yet the surrounding atmosphere is social and vibrant. Staff at Tresind are on the ball and ensure you’re well looked after. They operate with great professionalism and really add to the overall experience – from start to finish the hospitality was seamless. 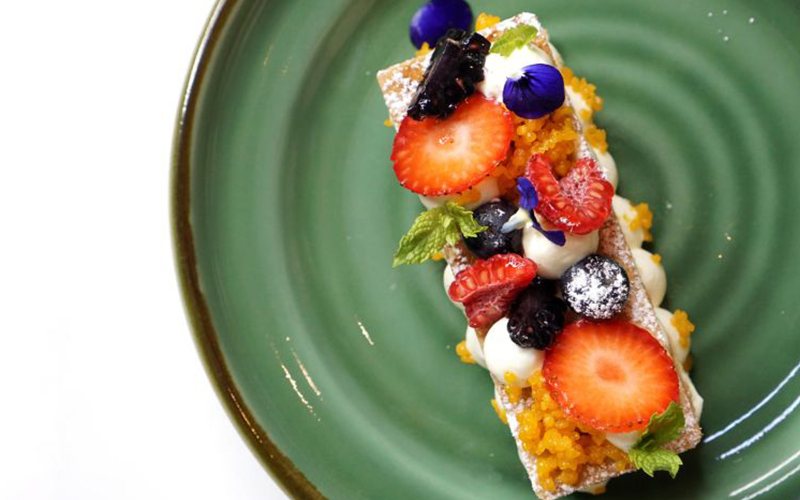 In line with its brand-new interiors, the menu at Tresind has too undergone its own evolution. 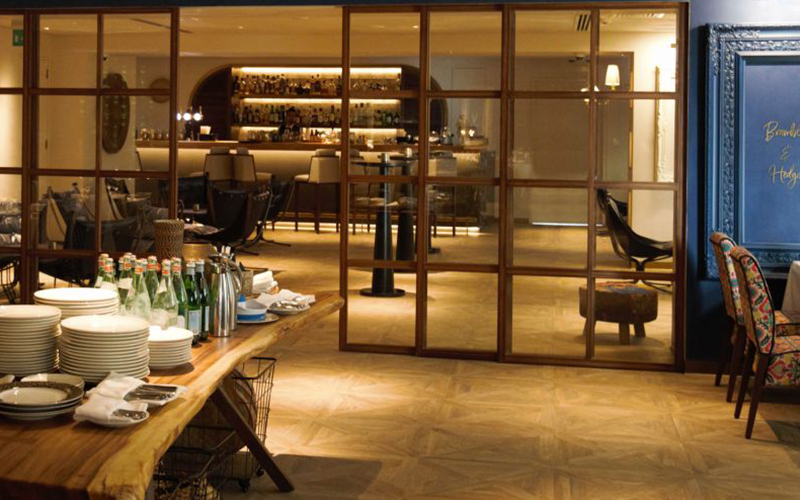 Led by head chef Himanshu Saini, the kitchen here operates with finesse and theatrics. A good majority of Tresind’s dishes are created and served tableside, offering an interactive, multi-sensory culinary experience that is quite evidently loved by its guests. To start, the journey begins with a pre-appetizer of okra, onion and mango focaccia, curd rice with cucumber and the most delightful pani puri, and butter and garlic prawns quickly follow – cooked before our eyes on a gas tabletop hob, the buttery, garlicy smell has my mouth watering before I’ve even had a bite. The finished product is tender and incredibly tasty. The interaction continues with cedarwood-smoked tandoori chicken, which is wrapped and torched at the table. Once served, the chicken is moist, succulent and bursting with flavour. 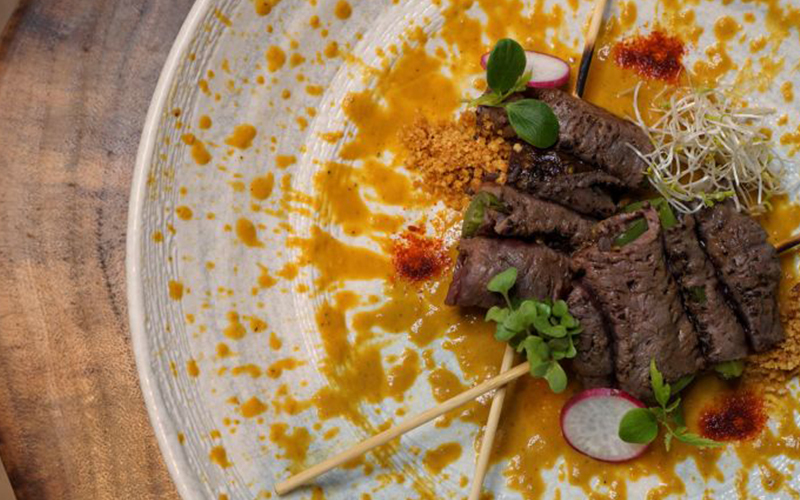 Next, deliciously tender strips of wagyu satay are served with a peanut dipping sauce and impress the whole table. Although still only making our way through starter dishes at this point, it’s clear to see why Tresind is so-loved by its diners. Not only are the portions generous, but each and every plate is presented with such attention to detail and all flavours are so thoughtfully paired. So much is so even for the yuzu palate-cleansing sorbet that’s served next, nestled in a cute lemon tree, accompanied with dry ice and all. For main, a trio of flavour-bursting curries comes, each of which showcases a different ingredient. I honestly can’t say one was better than the other, as they were all equally as good. If you’re visiting Tresind with a couple of friends, I’d definitely recommend getting the kadhai lobster, chicken chettinad and the Bengali kosha mangsho (a mutton curry) to share as they’re all too good not to try. As a lover of sweets, my dining partner had been eyeing up the dessert trolley all night, which had been hopping from table to table for diners to choose from the selection. Let’s just say, leave room for dessert as there’s an exceptional variety on offer. Tresind’s team are attentive and masters when it comes to hospitality – they truly make you feel at home and at ease. If you’re a lover of Indian food, Tresind is a must-try. The culinary team here really elevates and refines the cuisine, offering a well-rounded fine dining experience, while the interactive delivery, service and ambiance really allow for an all-round fantastic evening out. Before or after dinner, don’t miss a visit to the bar and lounge area, where expert mixologist Sherine John is on hand with a brilliant creative menu of his own. Want to go? For more information or to make a reservation, call 04 308 0440. If you enjoyed this article, you may be interested in reading more of our restaurant reviews.